I’m going to a rather famous fire tomorrow at 12 noon SLT – the destruction of the Crystal Palace. In reality, this happened on November 30th 1936 – so we will be witnessing it exactly seventy-five years later! Like most destructive events in Second Life, I imagine it will be great fun to watch – but it will also be mixed with sadness, because it represents the closing of an absolutely fascinating educational project, sponsored by one of Britain’s most prestigious academic institutions, the University of Bristol. 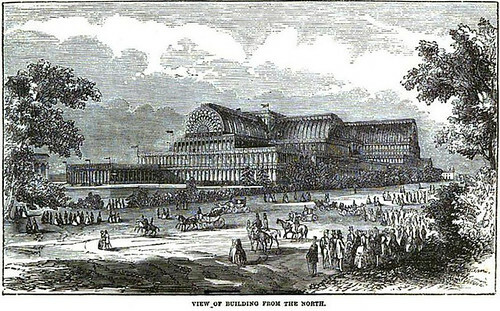 The project – which we covered on a Designing Worlds show – was to re-create the Pompeii Court at the famous Crystal Palace in London. This was set up in 1854, when Bulwer Lytton’s novel, The Last Days of Pompeii, was at the top of the Victorian bestseller charts. The novel centred around the people he supposed to have lived in a certain house that had been excavated in Pompeii, the one known as the House of the Tragic Poet. 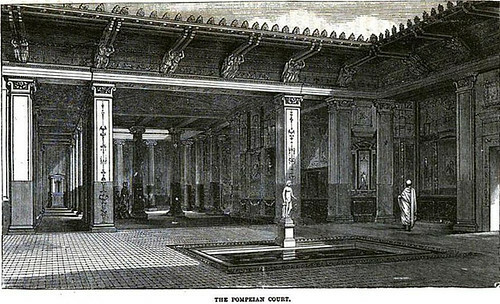 And it was this house that was recreated in the Pompeii Court in 18854 for the Victorians to come and experience how the Ancient Romans lived. 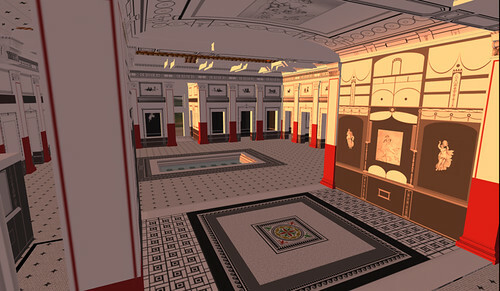 What this project in Second Life did was to recreate not Pompeii, but the Victorian re-creation of Pompeii, and in doing so it raised fascinating questions about the changing nature of historical re-creation, and about the nature of history itself and to what extent it is dependent on our own contemporary attitudes. The people behind the project are Dr Shelley Hales and Dr Nic Earle. Shelley is a Senior Lecturer in Art and Visual Culture in the Department of Classics & Ancient History, while Nic is E-Learning Co-ordinator at the Education Support Unit. 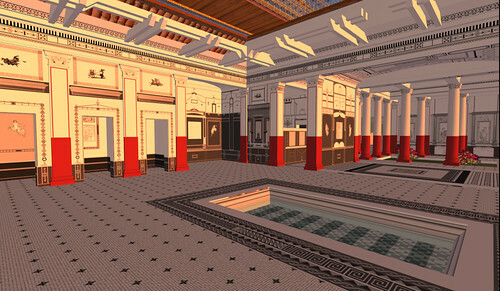 Their build not only re-constructs the Pompeiian Court ((and part of the Crystal Palace construction) but also features bots from the Roman and Victorian eras who can – in some cases – interact with visitors. You can see more about the project here on the Designing Worlds blog, and in greater depth here on the project blog. It was a stunning use of Second Life and I am very pleased to know that the project won’t be lost, but will continue. It will continue, however, in another place – in Open Sim, on servers belonging to the University of Bristol. And the reason for this is, very simply, that the cost of tier in Second Life, without the educational discount, is too high to justify continuing here, as Dr Shelley Hales told me. It’s a great shame to see projects like these go – not because they have come to the end of their cycle, but because of changed policies by Linden Lab. When the educational (and non-profit) discount was removed, it was clear that many organisations, especially in these straitened economic times, would be unable to continue and would look for cheaper alternatives. And that makes our Second Lives poorer. We saw it with the Homestead debacle, when Princeton calmly closed their art sims, citing the raising of their tier costs. And now we are seeing it as other academic institutions follow. If you want to join me to witness the end of the Crystal Palace, you can join us here for the fire at 12 noon. Previous Post: How to share your Hunt news with Happy Hunting! Next Post: Join the Expo Conversation with Prim Perfect! Another good SL build goes to OpenSim, one of many as campuses get the wherewithal to host their own IP. I miss the marketplace in SL for pre-made content, but OpenSIm has its charms as a frontier: make it, share it, or forget about it. This is my first term teaching an assignment in Jokaydia Grid. We have had bugs but the experience has been elevating, seat-of-the-pants fun. The students didn’t need fancy content. They just needed a good assignment. I have just recently been introduced to the topic of Second Life in an educational sense. 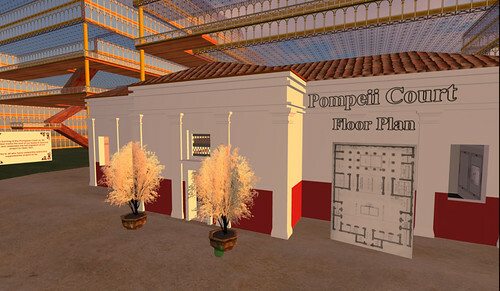 Reading over your post here about the Pompeii Court and thinking about the educational possibilities of ancient buildings like this makes me second guess my original thoughts that Second Life did not have a real place in education. Perhaps with tools like these there could be real value in Second Life. However, it seems that as I read this, the educational discount that you refer to has been removed, so I am assuming, based on your posting that organizations such as these will be doing less on Second Life and thus perhaps the educational value is reduced again. Any thoughts on how Second Life is going to hold up in an educational sense if projects like this one keep getting removed? It’s my understanding that as of July 24, 2013, the special pricing has returned and I so know of groups that have already taken advantage of it.